Eagle Editions has just released the first volume in a new two-part series on the evolution and operational use of the Focke Wulf Fw 190 D. The book is written by Jerry Crandall, well known for his many years of intense research into this aircraft. 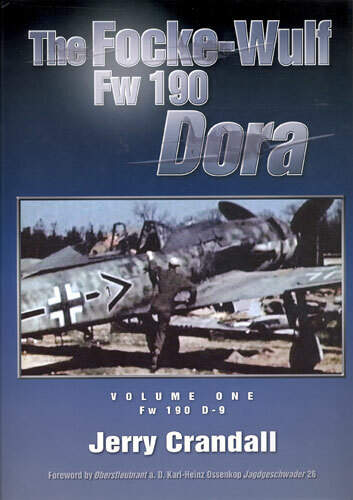 Volume one concentrates on the Fw 190 D-9, whereas Volume 2 will explore later versions of the aircraft. The book is 344 pages and printed on high quality glossy paper. There is no doubt that modelers and historians alike will appreciate 365 b/w and 40 color photos. Most of the images are seen here for the first time. Due to the paper quality, image reproduction is magnificent. As an added bonus, there are 72 full color profiles from noted computer grahics specialist Tom Tullis. The book begins with a forward by Oberstleutnant a. D. Karl-Heinz Ossenkop of Jagdgeshwader 26. He briefly explains his involvement with JG 26 and ultimately the Dora 9 having flown the aircraft in combat at the end of the war. Jerry explains in the preface how his interest in aviation began at a very young age. This would eventually lead him to cross paths in the mid 1960s with a FW 190 D-13, now displayed as “Yellow 10”. One must conclude that the author has been involved with the Fw 190 D for almost forty years, culminating in this superb effort! The story of the Fw 190 D begins with an explanation of its development and genesis from the Fw 190 A. Included in this section is a very detailed look at the five various gun cowls that were adapted to the Dora. This is elaborated upon early in the work as it provides an important visual clue as to who manufactured the aircraft. This includes Tom Tullis graphics supported by Jerry’s analysis. 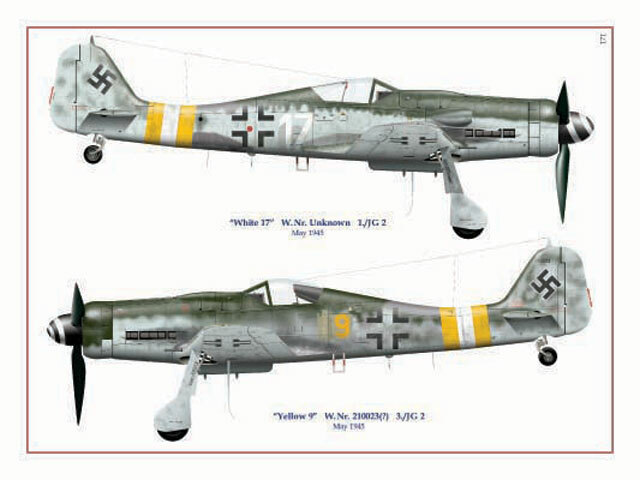 The Focke Wulf 190 D was intended to be a stopgap measure before the release of the Ta 152 to front line units. Consequently there are also some unpublished images of the Ta 152 at Mimetall Erfurt North. As modelers, we frequently forget that there is a human side to the war. For much of the remainder of the book, Jerry successfully intertwines pilot anecdotes and copies of log books with pictorial development of the aircraft at all front line units. The Tom Tullis profiles are accurate and superb! There are no less than 72 full color schemes scattered throughout the book for the modeler to feast upon. Many profiles depict the aircraft with canopies open and flaps slightly down being a departure from earlier profiles. Included with them are detailed notes on markings and camouflage patterns. These new profiles will result in additional decal subjects from Eagle Editions in their EagleCals product line. Tullis color scrap views also explain the unique JG 301 fuselage bands applied to the tails of their aircraft. The book concludes with a complete set of plans and exploded views. Drawn by Koichiro Abe, they are believed to be the most accurate plans to date on the D-9. All indications are that the book is selling very well and quite quickly. I am confident that this series will eventually become the primary resource for information about the aircraft and service history. Enthusiasts also have the option to purchase a deluxe leather bound edition limited to 350 copies and signed by nine Dora pilots. Anyone with an interest in German aviation history of World War 2, or the Fw 190 D in particular, really must have this important work in their reference library. Clearly it represents a lifetime of research and passion into one of the most successful fighter designs of the Second World War.